TOKYO – How many kids does it take to tow a 120-ton airliner? 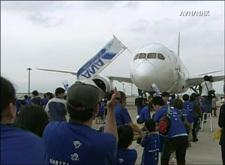 Almost 300 children and their parents managed to move a Boeing 787 at Tokyo’s Narita Airport Saturday (9/23). They used a series of ropes tied to the jet’s airframe. PARIS — Looking for that must-have ornament for a cavernous living room or backyard lawn? 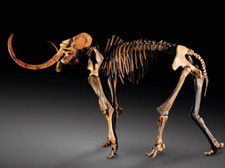 Perk up, Sotheby’s is putting a complete Mammoth skeleton up for sale in Paris. The auction house plans the Oct. 2 sale as part of a collection of fossils, skeletons, meteors and minerals — and even a dinosaur egg and woolly rhinoceros skeleton — from the Kashiwagi museum in Japan. The house estimates it will go for more than $240,000. The Mammoth skeleton, which has been arranged in a bit of an upward-facing pose, measures 11 1/2 feet in height — just slightly taller than it is long. Just ask Chris Tangey, who watched in awe as a 100-foot-high whirlwind of fire tore around a patch of Australian outback Tuesday Sept. 11. Tangey, a filmmaker, managed to capture some very rare footage of the startling phenomenon (see video below) while out scouting locations near Alice Springs, Australia, according to The Australian. One term for the event he recorded, a fire tornado, is a misnomer, according to Mark Wysocki, New York’s state climatologist and a professor of atmospheric sciences at Cornell University. The columns of spinning fire are much more similar to dust devils than tornadoes, Wysocki said. Like the dust devils that spring up on clear, sunny days in the deserts of the Southwest, a fire devil is birthed when a disproportionately hot patch of ground sends up a plume of heated air. But while dust devils find their heat source in the sun, fire devils arise from hot spots in preexisting wildfires. Though humans rarely witness fire devils, they may be more common than we think. Their most likely home, the blazing heart of a raging forest fire, is usually hidden from our view, Wysocki said. Because fire devils are filmed even less often than they’re seen, not much is known on the range of dimensions and speeds the phenomena can take on. They’re usually gone within a minute of shooting up. Tangey’s film might help to improve meteorologists’ understanding of fire devils, according to Wysocki. He says a lot of scientists’ knowledge on the physics of tornadoes came from analyzing footage caught by storm chasers. From Fox News, The Boston Herald and WWLP-22News.